When I was in fifth grade, or perhaps the summer just before (my memory is getting fuzzy nearly 20 years later), my mom's family had a yard sale. Of course, I'm sure I was forced to go whether I liked it or not, but I generally enjoyed the family yard sales, because even at age 10, I could appreciate some good new electronics. I was into gadgets and electronics of all sorts as long ago as I can remember. At this particular yard sale, in roughly summer 1992, my uncle had an Atari 2600 for sale, along with 5 games: Combat, Pac-Man, Demons to Diamonds, Haunted House, and Pole Position. I also recall my oldest cousin having his Game Boy (the 1989 original) next to it, with it's accessories and games wrapped up in masking tape around it. By this point, I had been an owner of a Nintendo NES since Christmas 1989, and I was intrigued by this game machine, that I had heard of (but wasn't sure where), so I managed to talk my mom into buying it along with an old KMC (Remember K-mart's store brand?) 13” black and white TV. I had it hooked up on the porch of my great grandmother's house shortly after, learning to play those 5 games. Eventually, I discovered that the local Big-Lots closeout store had tons of old Atari cartridges for the 2600 VCS, and I picked up a few of the $1-$3 specials when I could. I really don't recall what all I found, but Asteroids and Circus Atari come to mind. One I REALLY remember, though, is getting “Midnight Magic” for Christmas that year. I played that sucker for hours, figuring out ways to get the highest score. Midnight Magic is a 2600 convert of a slightly older Apple II computer game called “David's Midnight Magic.” It eventually made its way to other 8-bit computer platforms like the Commodore 64 and the Atari computers. 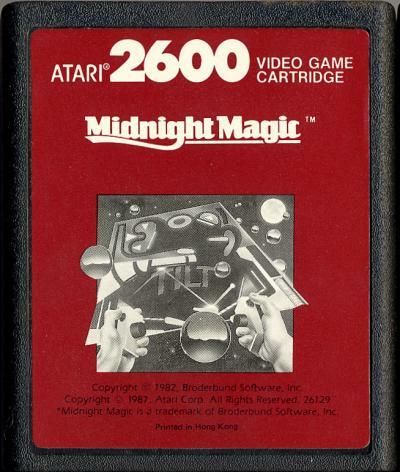 It is a pinball game, but much slicker than Atari's older “Video Pinball” cartridge for the 2600. Though I was late into the Atari world, since I was BORN during their reign over the living room, thanks, Atari, for the memories of Midnight Magic in my attic bedroom, in glorious black and white.